A desk-bound CIA rookie comes into contact with some of the agency’s more questionable practices. As a result, he begins to understand that the action for which he has been longing comes with a steep price, an acceptance of ethical expediency that can undermine anyone’s humanity. That kind of situation surely would make for an interesting movie. 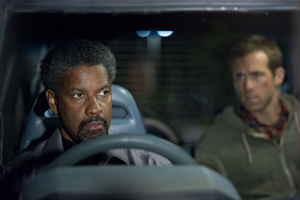 Unfortunately, Safe House — which focuses on the relationship between a CIA novice (Ryan Reynolds) and a former agent gone rogue (Denzel Washington) — is not that movie. Safe House is a jumbled mishmash of action wrapped around a strained plot that’s given a bit of extra cache by a strong cast that — besides Reynolds and Washington — includes Brendan Gleeson, Vera Farmiga, Ruben Blades, Sam Shepard and Robert Patrick, actors who, for the most part, are present without making a big impression. Most of the supporting cast hangs out in a media-heavy control room at CIA headquarters. Reynolds portrays Matt Weston, a CIA agent who’s working in a low-grade post in Cape Town, South Africa. Matt’s life changes when Washington’s Tobin Frost — a former agent who has wandered way off the reservation — surrenders at a U.S. consulate. Frost is brought to Weston’s safe house for interrogation sessions, which include water boarding. As the interrogators ply their morally dubious trade, the safe house is attacked by an unidentified group of invaders, a development that puts Weston and Frost on the run. Weston’s supposed to keep Frost safe so that he can be questioned and prevented from doing further harm to the agency and to the U.S. interests its supposed to protect. The rest of the movie proceeds in an action-oriented blur. Reynolds functions as a kind of straight man to Washington, who delivers another wily performance as a savvy, manipulative sociopath who knows every trick in the book. Why not? He seems to have helped write it. At one point, Frost overpowers Westen and puts a gun to his head; he spares the young man’s life while simultaneously insulting his prowess. Frost says he only kills professionals. It’s tough to top Washington when it comes to these kinds of obvious “power” moments, but I found myself hoping he soon finds a script that’s challenging in a totally different way. The pounding pace of Safe House doesn’t allow much time for reflection. That’s a good thing because the action can be as puzzling as it is improbable, all of it undergirded by the predictably cynical notion that the CIA is as devoted to treachery and betrayal as it is to gathering useful intelligence. Safe House could have benefited from more useful intelligence itself. Instead, the movie coasts on pre-digested attitudes, Washington’s undeniable appeal and lots of punishing action. Before it’s done, just about every character in Safe House takes some sort of beating. So, finally, do we.